The master at his best! Dr. Fred Carter, Ph.D., is one of the worldâ€™s classic knifemakers â€” one of only 25 makers invited to show at the Art Knife Invitational. 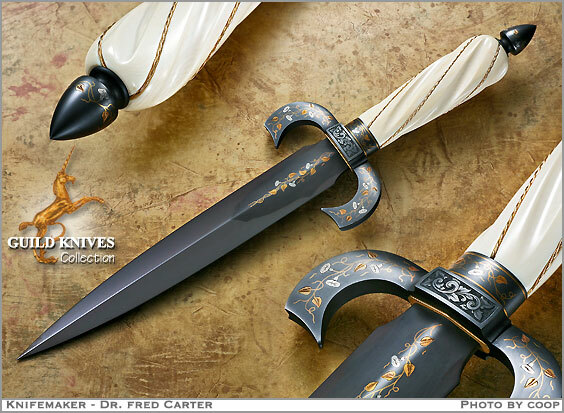 Carter has been known for years, as not only a superior knifemaker, but also, as one of the worldâ€™s top engravers. Being a botanist, you know heâ€™s got it right with these engraved inlays of Morning Glory flowers, depicting Silver blossoms with Gold vines and leaves on blued-satin ATS. Spirally-fluted Ivory handle with Gold twist wire wrap diagonals.